Max Healthcare, New Delhi, India. Despite the availability of over the counter antihistaminic H2 receptor blockers and proton pump inhibitors, severe complications of peptic ulcer disease are common and the incidence of potentially life-threatening ulcer complications has not declined. Peptic ulcer disease complications are on the rise in older patients because of an increased use of aspirin and other nonsteroidal anti-inflammatory drugs (NSAIDs). A gastric ulcer can penetrate to adjacent structures but in contrast to duodenal ulcer free perforation is rare. A 63 years old male presented to our emergency department with history of epigastric pain and fever of 3 weeks duration. On examination, there were diminished breath sounds in the left infrascapular area and abdominal examination revealed epigastric and left hypochondrial tenderness. On evaluation he had hemoglobin of 13.2 gm/dl, WBC count of 15.9 × 109/L (normal, 4-11). His liver function tests revealed total serum bilirubin of 20.3 umol/L (normal, 0-17); AST 35 U/L (normal, 15-37); ALT 31 U/L (normal 30-65); gamaglutamyl transferase 498 U/L (normal, 7-32) and ALP was 408 U/L (normal, 50-136). His serum amylase was 26 U/L (normal, 25-115); and plasma lipase, was 93 U/L (normal, 14-286). Urea, creatinine and electrolytes were normal. 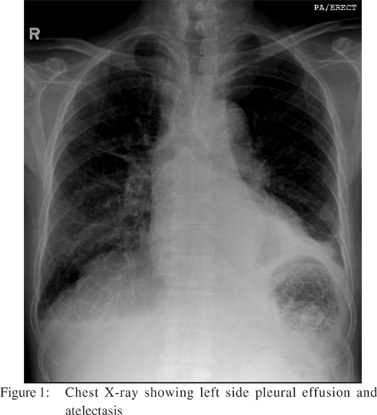 X-ray chest (Figure 1) showed left-sided pleural effusion with underlying atelectasis and heterogeneous opacity in the left upper abdomen. Also air and fluid was seen in left upper quadrant because of leakage of gastric contents. 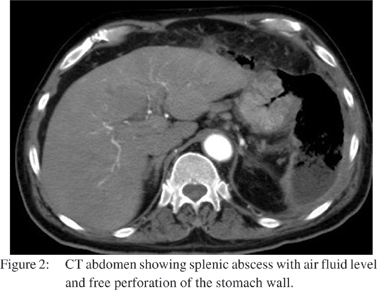 CT scan after intravenous and oral contrast (Figure 2) showed the splenic artery was thrombosed. A cavitary lesion, 18 cms x 12cms x 5 cms in size, with a thick irregular enhancing wall containing air and fluid was noted replacing the spleen. The capsule of the spleen was ruptured with extension of air anterior to the left hepatic lobe creating a pnemoperitonium, with an extension of the air pocket to the adjacent anterior abdominal wall. A free perforation in the body of stomach was present. 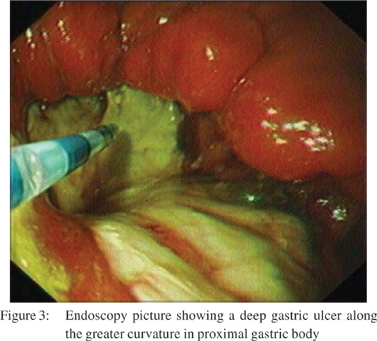 Upper GI endoscopy (Figure 3) revealed a deep ulcer along the greater curvature in the proximal gastric body, covered with very thick exudate which was difficult to aspirate. Biopsy from the margins of the ulcer showed chronic active gastritis with ulceration, no H. pylori infection was seen on special stain. The patient underwent ultrasound guided pig tail drainage and 350 cc of purulent material was drained. The culture from the drainage fluid grew E. coli sensitive to piperacillin and tazobactum. After receiving a 2 week course of intravenous antibiotics the patient was doing fine, and was discharged on proton pump inhibitors. In the era of proton pump inhibitors serious complication of peptic ulcer disease are still seen. Symptoms of gastric ulcer range from immediate pain after eating and non-specific epigastric discomfort to a complete absence of symptoms. Gastric ulcers can occur throughout the stomach. Eighty percent are located on the lesser curvature, usually in the antrum or the angulus. The fundus, body, and greater curvature are less commonly affected. The four major complications of peptic ulcer disease are bleeding, perforation, penetration, and gastric outlet obstruction. Upper gastrointestinal (UGI) bleeding is the most common complication among these. Comorbid disease increases mortality. [3,4] One-third to one-half of perforated ulcers are associated with NSAID use. [5,6] Gastric ulcers can penetrate to adjacent organs if left untreated. Unlike duodenal ulcer the free perforation of gastric ulcer is very rare. There are reports of penetration of gastric ulcer into the aorta, pancreas, liver, spleen, pericardium and other adjacent organs. Nishiyama et al reported penetration of spleen by a benign gastric ulcer with out free perforation in to the peritoneum. Another report has described a large gastric ulcer located in a giant hiatus hernia perforating into the heart leading to pneumo and pyo pericardium and cardiac temponade. Spontaneous pneumoperitonium secondary to penetrating benign gastric ulcer is rarely seen. In our patient there was free perforation of gastric ulcer in to the lesser sac resulting in thrombosis of the splenetic artery and splenic abscess. The left sided pleural effusion was due to inflammatory reaction adjacent to left hemi diaphragm. 1. Graham DY. Ulcer complications and their nonoperative treatment. In: Sleisenger M, Fordtran J, editors. Gastrointestinal Disease. 6th ed. Philadelphia: WB Saunders; 1993.p.698. 2. Ohmann C, Imhof M, Ruppert C, Janzik U, Vogt C, Frieling T, et al. Time-trends in the epidemiology of peptic ulcer bleeding. Scand J Gastroenterol. 2005;40:914–20. 3. Sharma SS, Mamtani MR, Sharma MS, Kulkarni H. A prospective cohort study of postoperative complications in the management of perforated peptic ulcer. BMC Surg. 2006;6:8. 4. Gunshefski L, Flancbaum L, Brolin RE, Frankel A. Changing patterns in perforated peptic ulcer disease. Am Surg. 1990;56:270–4. 5. Lanas A, Serrano P, Bajador E, Esteva F, Benito R, Sainz R. Evidence of aspirin use in both upper and lower gastrointestinal perforation. Gastroenterology. 1997;112:683–9. 6. Collier DS, Pain JA. Non-steroidal anti-inflammatory drugs and peptic ulcer perforation. Gut. 1985;26:359–63. 7. Nishiyama R, Nakamura S, Konno H, Endo T, Nishiwaki Y, Baba S. A case of splenic penetration by a benign gastric ulcer. Am J Gastroenterol. 1993;88:1964–6. 8. Brullet E, Campo R, Combalia N, Marques G, Armengol-Miro JR. Gastric ulcer perforation into the heart. Endoscopy. 1996;28:316–8. 9. Pickhardt PJ, Bhalla S. Spontaneous pneumopericardium secondary to penetrating benign gastric ulcer. Clin Radiol. 2000;55:798–800.